From the Hancock County Courthouse, go east 2 blocks (0.2 mile) to Boland Street. Turn right on Boland Street (which eventually becomes Linton Rd) and go 11.5 miles to Hitchcock Cemetery Road on the right. Turn right and follow Hitchcock Cemetery Rd for 1.8 miles. Turn left on Indian Trail Rd and go 3.2 miles until it dead ends into County Line Road. Turn right and go approximately 1.2 mile. The cemetery was somewhere on the right side of County Line Rd., which is also known as Friendship Church Rd. 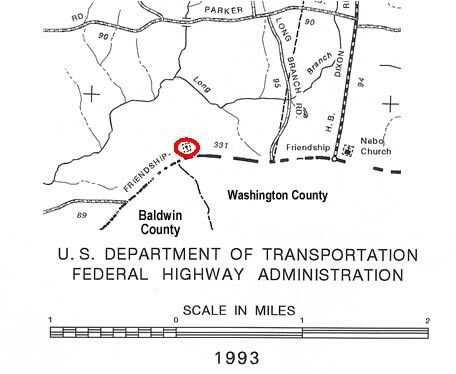 This cemetery is shown on the 1993 Hancock County DOT Highway map, but the cemetery could be not be found in this area at the time of the survey in 2004. Some logging has occurred in this area, and it is assumed the cemetery has been destroyed. The GPS has been estimated based on the location shown on the DOT map.